Rousseff is in her second term, but has faced plummeting support from Brazilians as the country is wracked by an entrenched recession and a health crisis caused by the Zika virus in the northeast. Many of its politicians—including some PT lawmakers—have also been implicated in a grafting scandal that has “hobbled” the state-owned oil company and fueled widespread distrust of the country’s leaders, according to the New York Times. “Almost every corner of the political system [is] under the cloud of scandal” in Brazil, reported the Times last month. 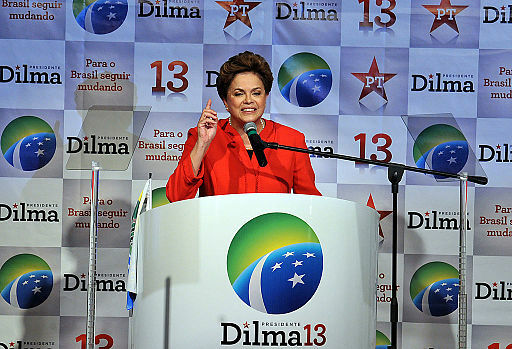 The graft scheme, called “Operation Car Wash” by investigators, has implicated most of Rousseff’s political opponents. The leader of the opposition party and house speaker, Eduardo Cunha, is not only being investigated for his role in the scheme but he was also named in the Panama Papers and outed as secreting away millions in a Swiss bank account as well as other offshore tax havens. Meanwhile, Rousseff has not been accused of any crime—which Brazil’s constitution requires, for a motion to impeach to be legally enacted. Instead, the impeachment proceedings are being justified by the revelation that Rousseff had temporarily transferred money from state-owned bank accounts to bolster the country’s social security program in 2014. A group allied with Brazil’s Landless Workers’ Movement (MST), called Friends of MST, described such transfers as “a procedure of routine public budget management at all levels of government—federal, state and municipal,” which was also used by previous administrations. Rousseff has never been accused of corruption and is not implicated at all in “Operation Car Wash,” the largest scandal to hit the embattled political class in Brazil for some time. While the right-wing parties are backed by Brazil’s wealthiest families and individuals, who also run the nation’s major media outlets, the lack of legal justification for Roussef’s impeachment has led critics to describe it—in no uncertain terms—as a coup. “It is a coup because while the Brazilian Constitution allows for an impeachment, it is necessary for the person to have committed what we call high crimes and misdemeanors. 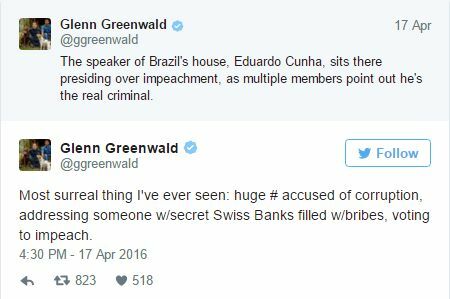 And President Dilma did not commit a high crime or a misdemeanor. Therefore, what is happening is an attempt by some to take power by disrespecting the popular vote,” said former president and Rousseff’s political mentor Lula da Silva. “It is a coup being carried out by the legislature, parts of the judiciary, and perhaps equally importantly, the vast majority of the media,” Weisbrot told Common Dreams. And the AFL-CIO joined the global critique, as its president, Richard Trumka, expressed solidarity with the Workers’ Party in a statement released Friday. “We firmly support the democratic, pro-worker programs for social justice that have been pursued and administered with professionalism and success, lifting over 40 million people out of poverty,” Trumka said. “There is no criminal accusation against the President,” notes the Secretary General of the Organization of American States (OAS), Luis Almagro, who has in the past been an ally of the U.S. in Latin America. “Rather she has been accused of the poor administration of public resources in 2014. This is an accusation that is political in character, and that does not merit an impeachment process,” Almagro writes. He also points out that the impeachment has drawn public critique from 130 members of Brazil’s public prosecutor’s office as well as from the United Nations and the Union of South American Nations (UNASUR). “Conscience must be affirmed in truth and justice, and the political conscience is only valid when it is expressed according to the existing institutions in the country,” Almagro concludes. Sunday’s impeachment vote was raucous and demonstrative, with politicians dedicating their votes to various family members and figures from Brazilian history—one even dedicated his vote to the general who led the anti-democratic coup in 1964 that ushered in decades of military dictatorship. The Guardian described the heated scene as politicians stood up one-by-one to condemn Brazil’s democratically elected president. It remains to be seen if Rousseff will end up being impeached, although observers note that after Sunday’s overwhelming “yes” vote, it seems highly likely. Temer is a member of the opposition right-wing party, and has also been implicated in the “Operation Car Wash” graft scheme.